Buried at Lowrie Cemetery, Havrincourt. William Pickard was born in Edenfield in 1899. He was the son of David Carr and Sarah Alice Pickard. In 1901 he was living with his parents at 5, East Street, Edenfield. He was a member of Stonefold Church and Sunday School, and was on the Stonefold Church Roll of Honour. Prior to the war William was employed at Birtwistle’s Carr Mill, Haslingden, as a stripper and grinder. He had been in France for about five months, when he was killed on 27 September 1918. He was 19 years of age and unmarried. At the time of his death the family lived at Blackburn Road, Haslingden. "On 7 September 1918 the 7th K.S.L.I. were engaged in the Second Battle of Bapaume. They made a most gallant advance, (in which Pte. Pickard probably took part), but suffered a total of 248 casualties. Notwithstanding this, they were, after a further period in the trenches, ordered into the line on 20 September to take part in the Battle of the Canal du Nord seven days later. At 5.20am on 27 September the Battalion, together with the 2nd Royal Scots on the left and the 1st Royal Scots Fusiliers in support, advanced towards the German positions 900 yards away. The attack, in spite of a heavy bombardment with gas shells by the Germans, which started at 3.30am and lasted until four, was a complete success. They gained their objective in spite of severe opposition. 'A' Company, on the right, had a particularly stiff fight to gain their objective, losing their commander, a platoon officer and 34 men. The centre company, pushing on slightly in front of their objective, captured a German battalion commander and 150 of his men. In addition the Battalion captured 52 machine guns, 4 trench mortars, 3 anti-tank rifles and 350 prisoners. Two officers and 37 men were killed in the attack and three officers and 127 men wounded". – From Bill Turner’s Book. 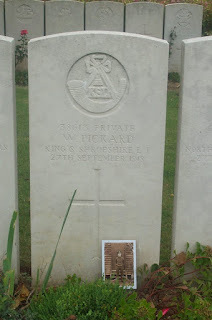 William Pickard is buried at Lowrie Cemetery, Havrincourt, France. 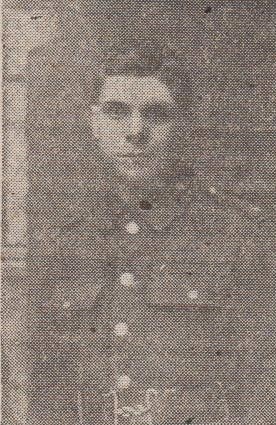 Official information has been received of the death in action in France of Private William Pickard of Blackburn Road, Haslingden. The deceased was formerly employed at Birtwistle's Carr Mill, Haslingden, as a stripper and grinder, and was highly respected and esteemed both by master and employees. He was a member of Stonefold Church and Sunday School. He had been in France about five months and was killed on the 27th of September. He was 19 years of age. 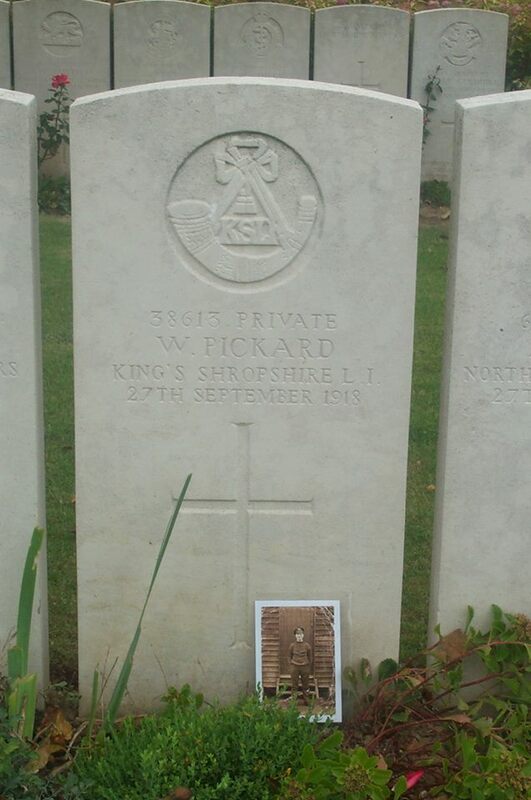 In loving memory of Pte., William Pickard, of the Shropshire Light Infantry, killed in action in France, 27th September 1918. To bear the heavy cross." From Uncle and Aunt and Grandma and Cousin Ivy, Higher Cloughfold. From his Uncle and Aunt, Manchester. He never will be forgot. How much, how dearly, and how well. From father, mother and James, 118 Blackburn Road, Haslingden. From his uncle and aunt, Trafford Park, Manchester. He earned the crown he wears to-day. From his uncle and aunt and grandma, Cloughfold.